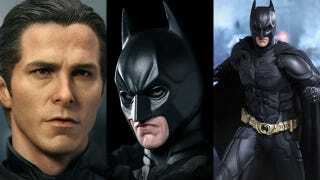 The full name for this product is "Batman - Bruce Wayne DX Sixth Scale Collectible Figure". That's for retailers, though. People like you or I will just know it as "holy crap it's a plastic Christian Bale". The 12" figure, made by Hong Kong-based Hot Toys (see here for their incredible Avengers range), won't go on sale until December, but if you think a replica Batman is worth $260, you can preorder it now. Included is everything except the kitchen sink. There's alternate hands, a ton of weapons, two heads (one with mask on, one without) and, coolest of all, two alternate mouths for the Batman head, one kinda pouting, the other in a classic "WHERE IS HE" scowl. I use "probably" in that headline because, well, Hot Toys seems to be on a bit of a streak with Batman figures at the moment.